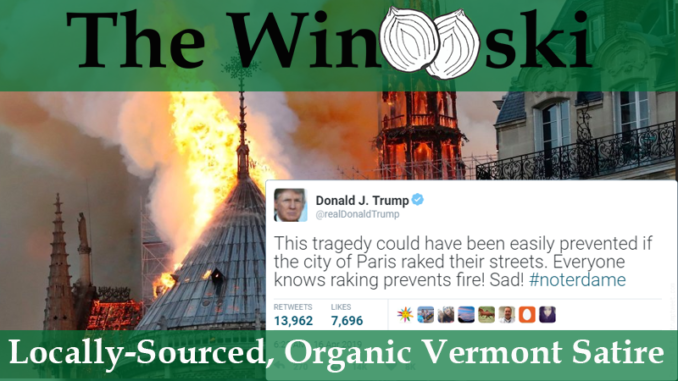 PARIS – As the world watched images of a cathedral burn with tears in their eyes yesterday, US President Donald Trump took to twitter to admonish city officials in Paris for not doing more to prevent the disaster. Following up his suggestion that they use “flying water tankers” to put out the fire, he went on to suggest on twitter that the fire was caused by a lack of city raking. “This tragedy could have been easily prevented if the city of Paris had raked their streets. Everyone knows raking prevents fire! Sad! #notredame” read the tweet, in which President Trump misspelled the name of the famous cathedral. French officials did not respond directly to the tweet, but did tweet out what is widely seen as an answer. “This is a terrible tragedy, and the official cause of the fire has not yet been officially determined, but today was a low fire danger day here in Paris, so we can safely say it was not due to any leaves, sticks, or other debris that needed to be raked up.” Paris officials responsible for the twitter feed did not respond to a request for comment. Trump would later go on to tweet that the fire would have been instantly extinguished if his “Space Force” were up and running. 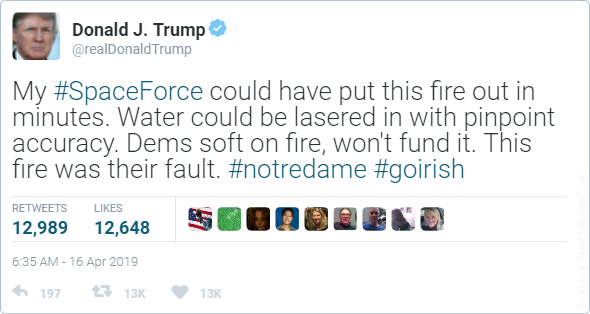 Apparently, besides its primary mission of American security, Space Force would also be scanning the globe for monumental fires and quickly extinguishing them using “water lasers,” according to the tweet. He also blames Democrats for the blaze and, while he spells Notre Dame correctly, also includes a hashtag commonly used for a different Notre Dame.